The family comedy based on the 1938 novel written by Richard and Florence Atwater will be waddling to Blu-ray just in time for the holidays! In an early announcement to retailers, 20th Century Fox will be bringing 'Mr. Popper's Penguins' to Blu-ray on December 6. 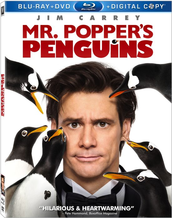 Jim Carrey ('A Christmas Carol') stars as Mr. Popper, a driven businessman who is clueless when it comes to the important things in life until he inherits six, “adorable” and mischievous penguins. As Mr. Popper quickly gets acquainted with – and increasingly attached to – his winged roommates, his life quickly unravels: the deal he’s long been working on with a formidable socialiate, Mrs. Van Gundy, played by the acclaimed Angela Lansbury ("Murder She Wrote," 'Beauty and the Beast'), is derailed and Popper almost lands in jail. While Popper’s penguins turn his swank New York apartment into a snowy winter wonderland - they teach him valuable lessons about family- human and otherwise! The Blu-ray/DVD/Digital Copy combo pack will feature 1080p video, 5.1 soundtrack, and supplements include: Audio commentary; all-new animated short: Nimrod and Stinky's Antartic Adventure; six original featurettes; Select deleted scenes with optional commentary; gag reel; Tooth Fairy 2 sneak peek; and theatrical trailer. You can find the latest specs for 'Mr. Popper's Penguins' linked from our Blu-ray Release Schedule, where it's indexed under December 6.